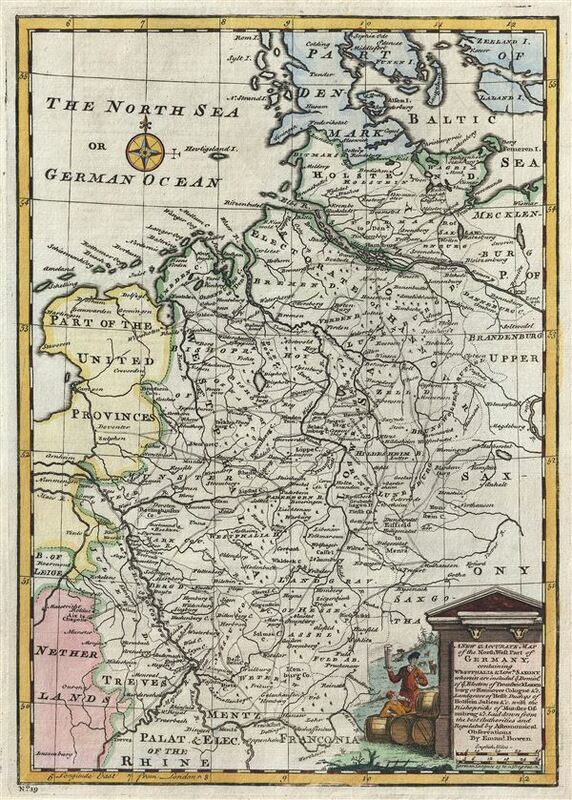 A New and Accurate Map of the Northwest part of Germany, containing Westphalia and Lowr. Saxony, wherein are included ye. domins. of ye. Electors of Brunswick Lunenburg or Hannover Cologne etc., Landgrave of Hesse, Duchys of Holstein, Juliers etc., with the Bishopricks of Munster, Osnabrug etc. This is an appealing 1747 map of the northwestern part of Germany by the British Cartographer Emanuel Bowen. It covers the Westphalia and Lower Saxony regions of Germany from Denmark south as far as Mainz (Mentz) and Frankfurt and from the Netherlands east as far as Brandenburg. Several important cities, towns, rivers, roads, lakes and other topographic features are noted throughout with mountains beautifully rendered in profile. Lower Saxony was one of the 'imperial circles' created by the Holy Roman empire in the 1500s. Groupings of regional territories were designed for defensive, tax, and administrative purposes within the empire. Westphalia, in 1648, became famous when the 'Peace of Westphalia' was signed in Munster and Osnabruck, ending the Thirty Years' War. The map includes a beautifully illustrated title cartouche in the lower right quadrant. This map was prepared by Emanuel Bowen as plate no. 19 for the 1747 issue of A Complete System of Geography. Rumsey 3733.018. Philips (atlases) 614 (1752 edition).